1. 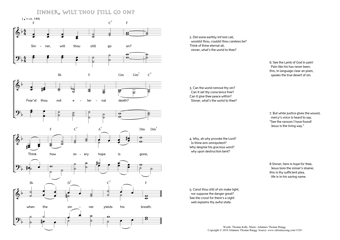 Sinner, wilt thou still go on? Fear'st thou not eternal death? wouldst thou, couldst thou careless be? sinner, what's the world to thee? 3. Can the world remove thy sin? Can it set thy conscience free? Can it give thee peace within? 4. Why, ah why provoke the Lord? Why despise his gracious word? nor suppose the danger great? well explains thy awful state. 6. See the Lamb of God in pain! speaks the true desert of sin. "See the ransom I have found! Jesus is the living way." life is in his saving name. Thomas Kelly, Hymns on various passages of Scripture, ca. 1853, Hymn 338. Diese Seite - www.christmysong.com/1524/index.html - wurde zuletzt wesentlich bearbeitet am 17.09.2018.